Here is what I made! 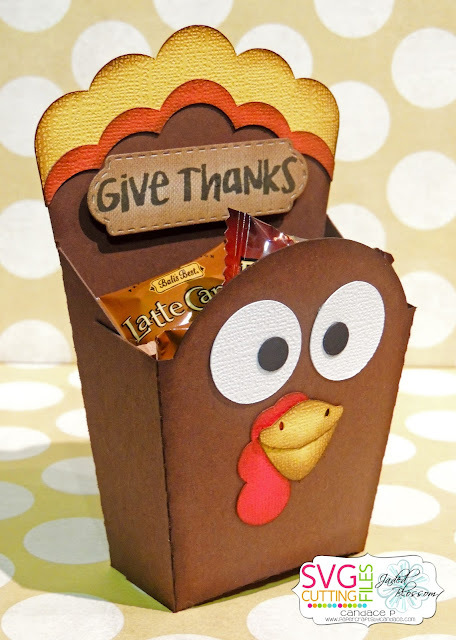 This Turkey Fry Box is NEW From SVG Cutting Files. This would be ADORABLE on the Thanksgiving Dinner Table, especially if you personalized them. From Jaded Blossom I used Mini Tag Dies 2 and Happy Fall stamp set. Gobble gobble give thanks. Nice job. look at that turkey ! he's so cute ! Makes me excited to decorate for Thanksgiving! super cute treat and decoration! Your turkey is so cute. His face is so darling. Love it. I love this little turkey box! Oh gosh...that is so fun! You're right. This would be great personalize!!! That is such a cute turkey face! Love how you shaded the beak. He's totes adorbs! I love turkeys! This is sooo cute! Great work and idea. These would be perfect for guests!! This is adorable! I love the idea of using in Thanksgiving place setting. Soo cute! Love your turkey project. What a cute turkey!! I love his eyes. Great job!! teeeheee this is too darn cute! So darn adorable! Love the turkeys face! Love the turkey box, would be great for any little treat for guests. I love the fry boxes! Oooooh! I so love this-- totally borrowing this idea for thanksgiving treats! My cousins will love these little cuties! What an adorable projects! May use for place markers at table this year! Thank you for sharing!! I love this idea for the dinner table! Cute. I like the colors and the shading. Adorable and perfect for the kids table! Very cute turkey treat box! I really like the way this was set up and turned out so good. Very cute turkey fry box!